The Texas Horsemen’s Benevolent and Protective Association (THBPA) recently concluded its annual Board of Directors election. THBPA members were selecting two owner and one trainer representatives. Owner Micah McKinney was elected to serve his first term on the Board, replacing longtime THBPA Board member Jim Helzer, who did not seek reelection. Additionally, incumbant owner Dr. Tommy Hays was re-elected to another term, and incumbent Guy Hopkins was re-elected in the trainer category to receive another term on the THBPA Board. Micah McKinney, vice president and general manager of Reliance Ranches, was raised in West Texas and grew up in the rodeo and performance-horse world. After graduating from University of Texas Permian Basin, Micah began to pursue a path in ranch management. Reliance Ranches was formed in 2004 with the purchase of land in Gardendale and Llano, Texas, along the purchase of race-bred Quarter Horse broodmares. As the ranches grew, McKinney’s interest in the Quarter Horse racing industry also began to grow. With McKinney serving as vice president and general manager of Reliance Ranches, the facility has grown into a prominent breeder and participant in the racing Quarter Horse industry. The Llano ranch now boasts a broodmare band of 18, weanling herd of 20, foal crop of 22, and several ex-race horses turned performance rodeo horses. McKinney is passionate about the future of racing, and in the Spring of 2012, he and his wife, Leslie, founded the Racing Free Organization to promote the elimination of performance enhancing drugs and the advancement of drug testing methods in the sport. 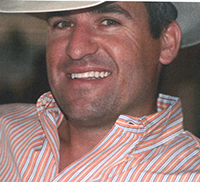 Micah has become very involved in Quarter Horse regulating organizations and is a member of the AQHA Racing Committee. With over 39 horses headed to the track next year under the Reliance Ranches name, Micah looks forward to making big strides in industry advancement. When he is not at the track, McKinney enjoys hunting, roping, spending times with his wife, Leslie, and children, Drake and Fisher. The THP would like to thank all the candidates who ran for election to serve and represent their fellow Texas horsemen. It would also like to extend a heartfelt thank you to Jim Helzer for his years of service and leadership. The THBPA’s 2013 officers, as well as the organization’s representatives for the Texas Horsemen’s Partnership Management Committee, will be selected at its next Board of Directors meeting.